While the American Heart Association recommends consuming fish twice a week, not all types of fish are equally beneficial. This is one time when you want to opt for a protein source that is higher in fat, since higher-fat fish contain more of the heart-healthy essential omega-3 fats. Herring make a nutritious choice, since they also tend to be low in mercury. So even pregnant women can safely eat up to 12 ounces of this fish per week. Each 3-ounce serving of cooked Atlantic herring provides you with 173 calories, 19.6 grams of protein and 9.9 grams of fat, including just 2.2 grams of saturated fat. This is 39 percent of the daily value for protein, 15 percent of the DV for fat and 11 percent of the DV for saturated fat if you follow a 2,000-calorie diet. While herring is a bit high in fat, it consists of mainly the healthy unsaturated fats, so it is healthy as long as you stay within the recommended fat consumption for the day. Herring is rich in minerals, providing you with 56 percent of the DV for selenium, 10 percent of the DV for potassium and 26 percent of the DV for phosphorus in each 3-ounce serving. Selenium helps form DNA and acts as an antioxidant to prevent cell damage from free radicals. You need potassium to help balance out the effects of sodium on your blood pressure, and phosphorus helps you form strong bones and keep your kidneys functioning properly. While herring isn't a particularly good source of the B vitamins folate and thiamine, each serving provides 14 percent of the DV for riboflavin, 18 percent of the DV for niacin, 15 percent of the DV for vitamin B-6 and 186 percent of the DV for vitamin B-12. These B vitamins all help you turn the foods that you eat into energy and keep your hair, liver, skin and eyes healthy. A serving of cooked herring also contains 46 percent of the DV for vitamin D, which helps reduce inflammation, form strong bones and keep your immune system functioning properly. People often don't consume the recommended 500 milligrams per day of the omega-3 fats docosahexaenoic acid, or DHA, and eicosapentaenoic acid, or EPA. Eating a 3-ounce serving of cooked herring, however, will provide you with 2,014 milligrams of these essential fats, which help keep your heart healthy and may even lower your risk for Alzheimer's disease, although more research is needed to verify this benefit, according to Colorado State University Extension. Although pickled and kippered herring are both tasty alternatives to plain herring, they shouldn't be a regular part of your diet. 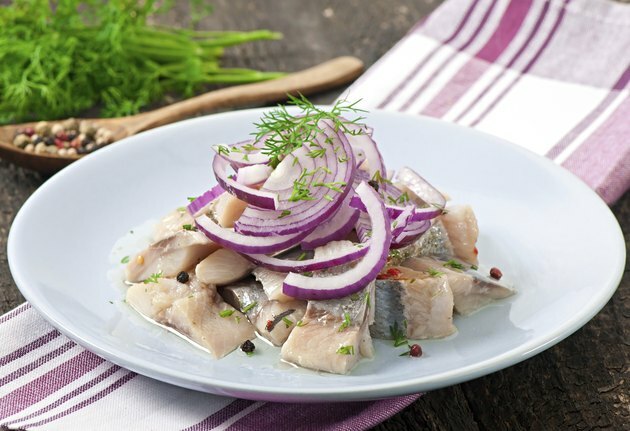 While plain herring only provides 98 milligrams of sodium per serving, pickled herring contains 740 milligrams and kippered herring, which is brined and smoked, provides 781 milligrams of sodium per serving. This will make it difficult to stay within the recommended daily limit for sodium of 2,300 milligrams for healthy people or 1,500 milligrams per day for those with high blood pressure. Consuming too much sodium puts you at higher risk for heart disease since it can increase your blood pressure.